Elon Musk asks: What do you want to see in a Tesla pickup? Tesla doesn’t really do press releases. When your company CEO is an international social media personality with 22 million Twitter followers, it’s much easier to get the word out with a few Elon-tweets. Here we go again. Today, the Tesla founder and interplanetary firework enthusiast has started crowdsourcing ideas for a new Tesla pickup truck, to join the ranks of the Model S, Model X, Model 3 and the mooted upcoming Model Y EVs. “The Tesla Truck will have dual motor all-wheel drive [with] crazy torque [and] a suspension that dynamically adjusts for load. Those will be standard.” He then clarified to repliers that the suspension would also be manually adjustable, so the truck can raise and lower itself when stationary to make unloading easier. Beyond that, there’s very little concrete data on what we can expect from a Tesla truck—like whether it’ll rival the massive Ford F-150 and Chevrolet Silverado or aim for the likes of the Nissan Navara and Mercedes X-Class. And of course, there’s no date for production yet, because Tesla’s still working on bringing Model 3 production up to speed. And then making the Model Y. And the new 402kph Roadster. And the Tesla Semi unit. That hasn’t stopped thousands of enthusiasts replies to Twitter’s favorite laterally thinking billionaire industrialist, though. And as the pickup market continues to swell worldwide—without making great strides environmentally, compared to the rest of the car industry—a Tesla offering fully electric drive and people-pleasing unique features could be a canny tactic from the Californian start-up. 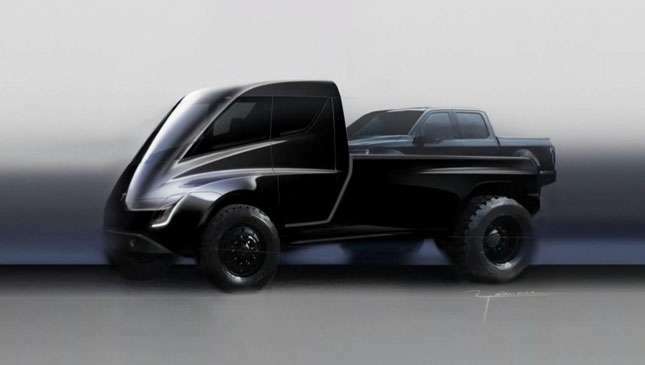 So, with some symmetry to our ask-the-people story, we end by asking you—a Tesla electric pickup truck: Good idea?